The marches yesterday were really impressive, but there is a way that school children could be many more times effective in carving out their future on these issues. Australian and State governments are pretty resistant against democratic protests, and anyhow, our governments at all levels don't have much of a clue about what to do about providing energy to our increasing populations. Schools and schoolchildren could exert much more pressure and constructive effort at a local level and we hope they will. The Hon. Kelvin Thomson, former Federal Member for Wills, is joining the Sustainable Australia Party. Mr Thomson served as an Australian Labor Party Councillor for the City of Coburg from 1981 to 1988, Member of the Victorian Parliament for Pascoe Vale from 1988 to 1996, and Federal Labor Member for Wills for over 20 years from 1996 until the 2016 Election. 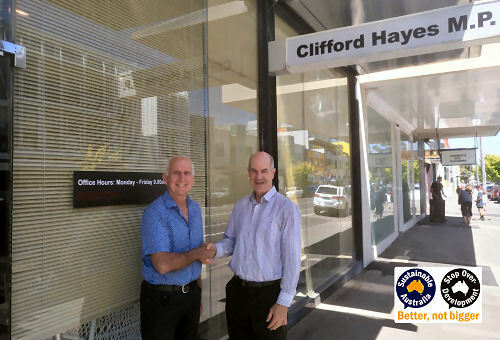 Mr Thomson will be advising Sustainable Australia’s first elected Member of Parliament, Mr. Clifford Hayes, who was elected as a Legislative Councillor for the Southern Metropolitan Region at the recent Victorian election. Letter to ABC's 7.30 Report on its (again) woeful reporting on population growth/immigration. The statements being made by politicians and commentators re the size and growth of the population/immigration intake are (deliberately) ignorant, seriously uninformed or deliberately politically biased. And the coverage of this issue by your program and ABC journalists more generally also lack quality research, lack of 'joining the dots', failure to question unfounded claims by the above and, in some cases, unquestioned acceptance and repeat of demonstrably untrue statements. Please consider the following demonstrable facts and follow the inevitable conclusion. Read more about Letter to ABC's 7.30 Report on its (again) woeful reporting on population growth/immigration. Ex Labor leader, Mark Latham, recently joined Pauline Hanson's One Nation Party and will be running for the NSW legislative council at the next state election. Here is his 8-Point Plan to "save Sydney “suffocating” from overpopulation and overdevelopment." 1. Our immigration program must be framed in the interest of the people who live here now. This is especially true of policies impacting on an over-crowded, increasingly dysfunctional city like Sydney. 2. Permanent immigration numbers should be slashed, bringing them closer to their 20th Century average of 70,000 per annum (down from 190,000 currently). Temporary visas must also be cut back. 3. NSW should not take any more special refugee intakes, given the mismanagement of Syrian refugee settlement by the Baird Government. "Only the Liberal Party will protect the amenity and character of our neighbourhoods and rural hinterland," says Russell Joseph, Liberal Candidate for Nepean. We don't often publish statements from the major parties, but this is the first one we know of that looks at protecting the Mornington Peninsula. The Peninsula is an incredibly biodiverse part of South-Eastern Australia, hardly explored to date in terms of paleontology, rapidly losing its native fauna and flora. The undeniable fact that governments since Jeff Kennett have promoted destructive population growth here makes any policy to protect it extremely important. We will publish statements from any other political party that has a plan to protect the Mornington Peninsula from overpopulation. How dare the Urban Development Institute of Australia tell the State Government that it should set housing targets for each council to cope with Melbourne's rapid population growth and then if we don't meet the targets they set we will be victimised. They even specifically mentioned Boroondara and Stonnington as not pulling their weight and referred to NIMBYs. As a resident of Boroondara I can assure the Development Institute that Boroondara is being flooded with buildings to such an extent that the whole neighbourhood character is being ruined, what on earth do they want. High rise on every suburban street? The real problem is that Melbourne is getting too many people coming to the city. Even Planning Minister Wynne is quoted as saying that Melbourne has the highest growth rate of any city in the developed world. We have been saying this for years as we see it's livability being wrecked. People all across Melbourne are complaining as they see their areas being overcrowded and over developed. The Federal Government must reduce immigration - tell them we are full to bursting. Do they want to turn us into a dense third world city with polluted gridlocked streets? Many of us are saying, having watched the Royal Commission into the Banking World, that it is time for a Royal Commission to examine the Developers World. What is the cause of illiteracy on overpopulation? And what are the dangers? Read more about What is the cause of illiteracy on overpopulation? And what are the dangers? St Kilda Road and Hoddle Street widening to accommodate larger volumes of road traffic in Melbourne means bulldozing hundreds of beautiful, mature trees, cultivated in a time when people appreciated the importance of natural shade and beauty. This vandalism is caused by willful promotion of overpopulation by the Victorian State government. Furtively supported by an equally venal Opposition, invited economic mass immigration-caused population growth marches on like an invasion preceded by bulldozers, jack hammers and all manner of violence towards our environment and display of might by state governments. Australia grew by over half a million people between July 2016 and July 2017, although natural increase actually declined, almost certainly due to rising costs affecting Australia's fertility opportunity. (Article by Sally Pepper.) On New Year's Day, January 1st 2018, as I surfaced around 10.00 a.m, I heard on the news that power prices and tolls on roads around Melbourne will both increase and, that this year many Victorians will experience additional economic hardship. My immediate defensive thought was, "Well I don't use tollroads and I guess I can be more frugal with my use of gas and electricity." What does happiness mean to you? We tend to search for it in material things, substances, and career achievements, but often lose sight of what really matters to us in the process. London-based artist and animator Steve Cutts is taking a long hard look at this ‘rat race’ to which we’ve all found ourselves tied, and is examining our modern sources of joy in a satirical new short film that depicts us as the ‘rats’ we’ve become in the eyes of the system. It’s titled after that mysterious high we’re always chasing; “Happiness.” Take 4 minutes out of your busy day and watch the clip for yourself below, and tell us in the comments if you think Cutts hit the nail on the head. Beans on Toast wrote the song and allowed this mash-up for his song. Nina Paley did the animation. It was posted in observance of World Population Day, July 11. This song and video offer the simple truth. The world is overpopulated, and we human beings are still adding over a million a week to the planet, contributing to - if not creating - every crisis the world faces. 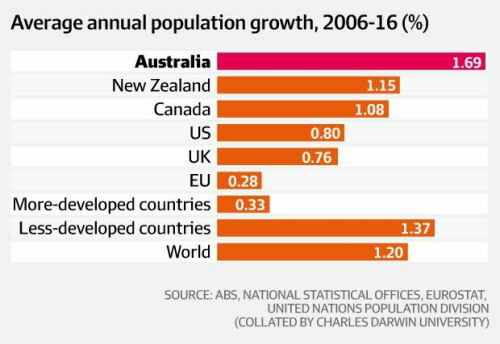 It's a good song but it doesn't mention immigration, which is how Australia's population is growing faster than any other country in the OECD's. I have just come back from 2 weeks in my old home Jakarta. When we went there to live there were 3 million people and it was easy to get around and very manageable. Those were the good days. The Governor, Ali Sadikin, closed the city to more incomers on advice from UN city planning experts as they said the bigger a city gets the harder it is to manage and the mega cities are beyond human management. Immigration was reduced down to those who had work permits. 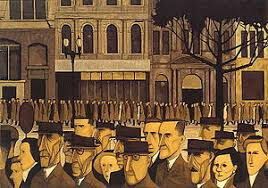 (Immigrants in this case refers to people coming to the city from the countryside). The Governor himself told me the story that the President eventually forced him to open the city to immigration. Population is now maybe 10 million and growing. The city is a total polluted gridlocked nightmare.